From the man who brought you the writing from the series, Bones, comes this action packed, sarcastically funny, thriller that picks up speed with each chapter. See our mixed reviews below. Skellig owns a limo company and enjoys his job, giving his illegal friend a place to work without necessary paperwork, doing what he wants, when he wants. His latest job is driving around Bismarck Avila, a professional skateboarder with a lot of money who always gets his way. Saving Avila from an unwanted bullet to the head, one of Avila's bodyguards ends up dead and Skellig ends up in jail for murder. Avila's willing to let Skellig go and give the law the true story of Skellig saving his life... on one condition, Avila buys out the limo company and they work exclusively for him. Skellig doesn't really have a choice and so begins this action packed thriller where Skellig is now not only Avila's personal chauffeur, but body guard as well. It took me about the first 80 pages to get used to the writing style. It was a little... what's the word I'm looking for.... unique. But once I got used to that, the book took off for me! All I could imagine is Jason Statham driving around Shaun White for some reason and in my head, it worked! Some absolutely funny moments (I do love sarcasm), engaging characters (whether you like them or not) and a plot that picks up speed with each chapter. I can absolutely see how this came from the writer of the TV series Bones. I'll be keeping an eye out for more of his work. Reading the description for the book and seeing the awesome cover (you all know by now that I’m a sucker for a great cover) I knew I needed to read this! 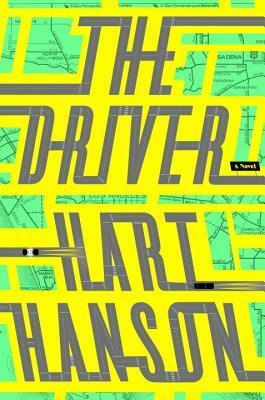 THE DRIVER by Hart Hanson – the mind behind the TV show Bones – was a great thriller. It had all the elements you love, but with a touch of humor. Usually that doesn’t sound like a good combo, but Hansom meshes them flawlessly and made for an incredibly enjoyable read. Michael Skellig is a limo driver and he’s waiting for his client outside of an upscale hotel. His current client is a skateboarding mogul, Bismarck Avila and his bodyguards. Skellig is also the owner of the limo company and he, along with his group of employees, is a veteran. Specifically an Army Special Forces sergeant and his training kicks in – something changes in the wind causing him to think one thing: troubletroubletrouble. He goes running in to get Avila and just in time, because two Chechen gunman attack and kill one bodyguard and put Skellig in the hospital. When he wakes up in the hospital he finds himself in custody and is the only person of interest in this murder. Things get complicated when Detective Delilah Groopman from the LAPD gets involved – someone that Skellig has always been fond of. Avila is willing to help clear Skellig’s name but only if he becomes his personal chauffeur – seems like a great gig? Well, Skellig would like it a lot more if his client wasn’t obviously a target for murder. Will he be able to clear his name and save Avila? I loved the writing. While some people might find it to be overly descriptive or, at times, too comical, I felt that it worked very well for this book! It’s a very uniquely written thriller and made for a quick read! I love when thrillers and mysteries have all of the elements we love but also have something that sets them apart. The characters were great and the mystery was there to keep the pages turning. The relationships and interactions between the characters were genuine and showed how unique they all were – with most being wounded veterans, Hanson presents the different mental effects very well. There were some violent parts towards the end, so that added to the thriller elements we know and love (sometimes). Overall, I loved the added humor. I know that won’t be for everyone, so if you aren’t looking for a thriller with a lot of laughs thrown in, then you’ll want to move on. Hart Hanson perfectly meshes comedy with mystery! 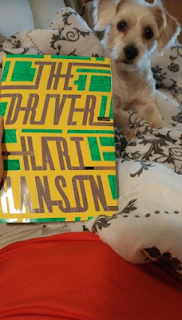 Lately, I have been craving an action style thriller, so, when #cjsreads decided to make The Driver by Hart Hanson one of our August picks, I was excited to dive in! I am bit of a sucker for Hart Hanson; he is the creator of Bones and one of the main writers on the show, so I was curious to see how his television writing would transfer over to a novel. Also, although he is American, he lived in Canada at one point, so he is pretty much an honourary Canadian. Needless to say, I had some high hopes for this book! The novel opens with Michael Skellig, an army veteran/ex military officer turned limo driver, waiting for his high-end client behind an upscale hotel. Feeling like something isn’t right, Skellig moves inside the hotel just in time to save his client from two gunmen, but is too late for one of his body guards and Skellig ends up in custody for murder. Romantically involved with both the detective on the case and his lawyer, Skellig ends up released under the condition that he becomes his high-end client’s personal chauffeur and protector. Sounds all fine and dandy, except that someone clearly wants him dead and the only person who stands in the way is Skellig. The general premise was interesting to me but from the first pages, I found the narration to be really problematic. It felt choppy. It felt sort of confusing and I really struggled to try and figure out exactly what was going on. Really, as I was reading, I continuously thought to myself, ‘I think this would make more sense on screen”, which truly does make sense given the background of the author. I also found, surprisingly, that this one moved fairly slowly. The pace does pick up eventually, but I found it slow and steady until about the 60% mark. I didn’t find Skellig a particularly likeable protagonist but I did love the dry wit and humour that he brought to the text; I felt like his character was well developed and complex. Hanson did a great job with him. Overall, this one left me feeling disappointed due to the choppy narrative style but I absolutely think that this one will end up being one of those “marmite books” that people will either absolutely love or hate. I think fans of something a little less traditional will really enjoy this book. She gave this book 2 stars. Big thank you to Dutton Books for these copies in return for our honest opinions.